The #OpIsrael Birthday campaign took place as scheduled on April 7 and involved thousands of participants from all over the Muslim world, from Indonesia in the East to Morocco in the West. It seems that the bulk of the activity focused on leaking data obtained from various breached databases. Some of the data published was simply a recycling of older data dumps, but some was new and included email addresses, passwords and personal details. Hundreds of government email addresses were leaked and posted on Pastebin. In addition, private password-protected website databases were also leaked. The Islamic Cyber Resistance Group (ICRG), affiliated with Hezbollah and Iran, leaked hundreds of Bar-Ilan University email addresses and defaced a sub-domain of the University’s website. According to the campaign’s official website, approximately 500 Israeli websites were defaced by AnonGhost, most of which were SMBs and private websites. The level of awareness and readiness in large organizations (but also in small ones) has improved and is improving each day. During this campaign we have not seen attacks waged by nation-state actors such as the Syrian Electronic Army, the Izz ad-Din al-Qassam Cyber Fighters and others. It appears that the attackers focused on attacking government sites and leaking databases. In addition, the number of authentic dumps containing email addresses, passwords and personal details was much bigger than the last campaign. However, under the surface we have been noticing in recent weeks an emerging and concerning trend. We know that hacktivist groups and terrorist organizations try to develop their own capabilities. Those groups are also share information between themselves (guide books, scripts, tutorials). Lately we even have identified exchange of capabilities between Russian cyber criminals and anti-Israeli hackers and hacktivists. The next phase, and we are not there yet, might be the purchase of advanced cyber weapons by terrorist organizations. It can be only a matter of time until terrorist groups (al-Qaeda for example) use sophisticated tools to attack critical infrastructure systems. If this happens, the results of the next OpIsrael campaign would be completely different. 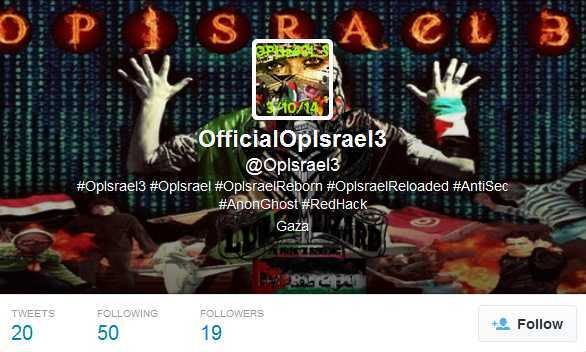 On February 9, 2014, anti-Israeli hacker groups announced a cyber operation against Israel scheduled for March 10. According to a press release issued on Pastebin, all hacktivists worldwide are called upon “to wipe Israel yet again off the cyber web on March 10th, 2014 on the anniversary of Israels attack on Palestinian leader Yasser Arafat’s office in Gaza City”. The attackers published a target list of about 1,360 websites, including government websites, banks and financial institutions, media outlets, academic institutions, defense industry, etc. We have identified several hacker groups that will participate in the campaign. One of them is AnonGhost that initiated the April 7, 2014 campaign. Another interesting group is RedHack – a Turkish hacker group that recently waged several high-profile attacks. The attackers have also created an official Twitter account and a Facebook page, where they have posted links to download various attack tools, such as DDoS, SQL, RAT, keyloggers and more. As was the case in previous campaigns, we assume that pro-Palestinian hacker groups will launch cyberattacks against Israeli websites, but with a low success rate, especially with regard to banks and critical infrastructure websites.